You are currently browsing the The Movie Mark blog archives for August, 2013. As many of you know, the old incarnation of The Movie Mark contained almost 500 hilariously insightful movie reviews. It would be a shame for all of that hard work to be lost in the bandwidth abyss, so what better way to constantly update TMM than to recycle my classic reviews? No need to thank me and shower me with praise; I’m just doing my civic duty. With all the negative fallout regarding the shameful announcement of Ben Affleck as the new Batman *tries to control gag reflex* I decided to find some reviews I did in which Affleck made an appearance. 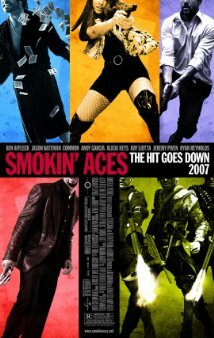 He had a mere cameo in Smokin’ Aces, but my review is hilarious, so that’s what I’m posting today. So go read the review and enjoy!